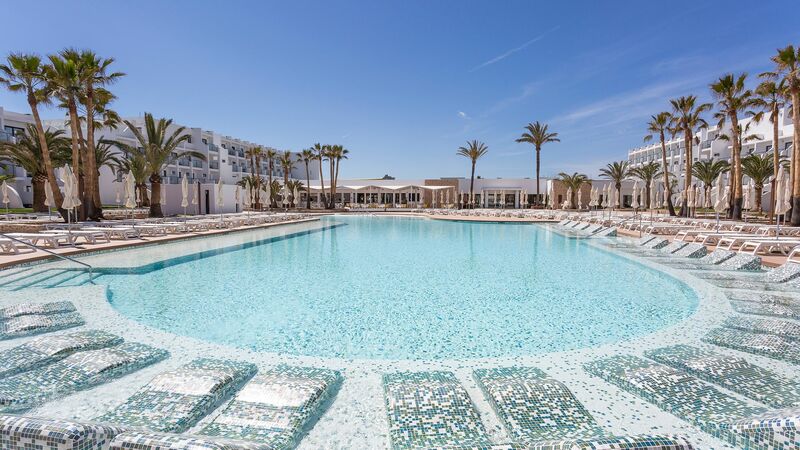 Occupying a premium beachfront location in the cosmopolitan area of Playa d’en Bossa, the Grand Palladium White Island Resort & Spa offers chic accommodation within easy reach of some of Ibiza’s biggest attractions. Opened in 2015 after a major refurbishment, the hotel has 430 bright and spacious rooms which come with all the amenities that you would expect from a luxury hotel. Rooms benefit from views of the lush gardens, beautiful pool complex or the crystal clear water and white sands of Playa d’en Bossa beach. If you’re looking to remain active during your stay then why not enjoy a game of tennis or visit the hotel’s gym. 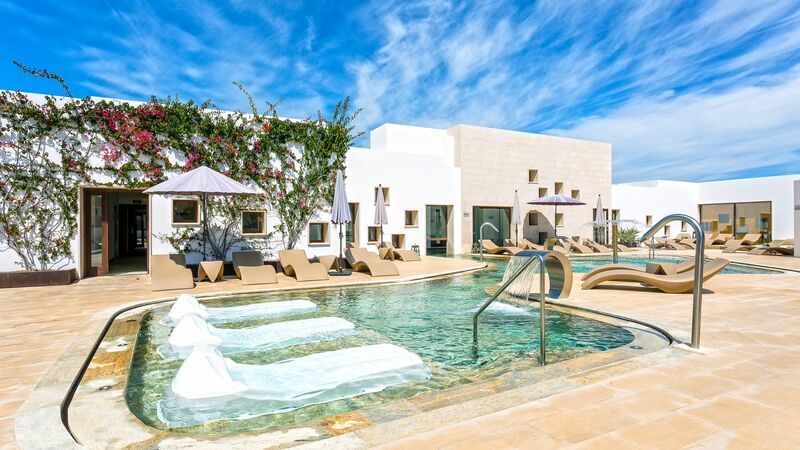 If you’d prefer to soak up the chilled out vibes of Ibiza then relax by one of the hotel’s pools or indulge yourself at the luxurious spa. Guests will be spoilt for choice when it comes to dining options as the hotel is home to a number of restaurants with their own range of freshly prepared local and international dishes some of which are served in an al fresco setting with spectacular views of the Ses Salines Nature Reserve and the calming Mediterranean Sea. The hotel has 430 rooms, 3 floors and 2 lifts. Breakfast, lunch and dinner. Local and international branded alcoholic and non-alcoholic drinks. Snacks. Ice cream. Guests are also able to use all of the facilities and dine at the Grand Palladium Palace Ibiza Resort. Located within the main building, this buffet restaurant offers a selection of local and international cuisine as well as show cooking and themed nights. 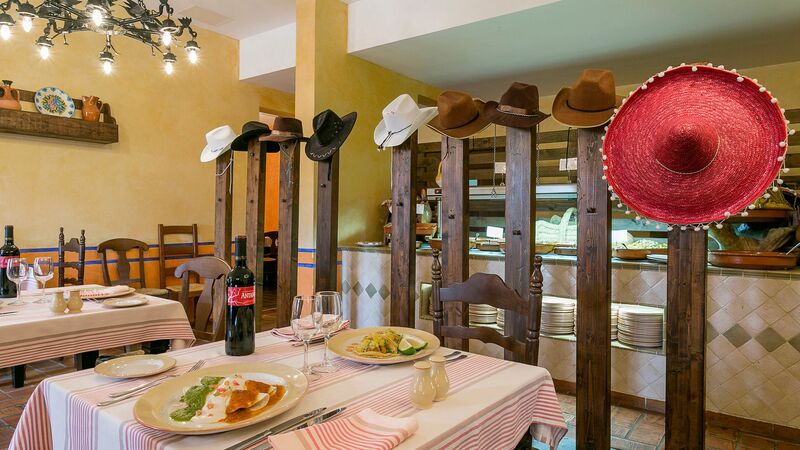 Enjoy traditional Mexican cuisine in this laid back restaurant. 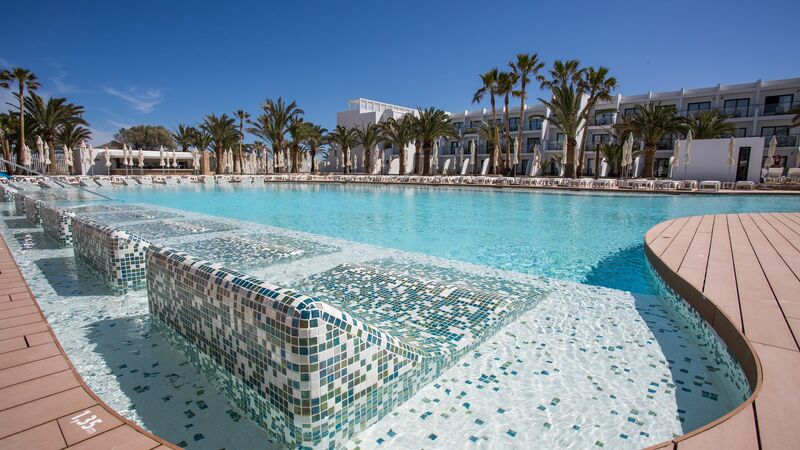 Located at the Grand Palladium Palace Ibiza Resort. 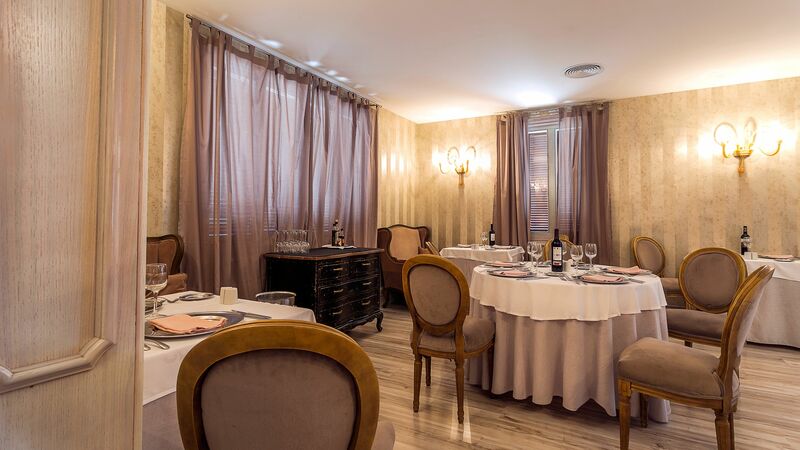 Dine in the elegant setting of the Il Palazzo restaurant. Enjoy a selection of cocktails and ice creams whilst chilling around the pool. The freshwater swimming pool with aqua beds is ideal for relaxing and there are additional pools located at the neighboring sister hotel, the spa and the mini club. Located at Grand Palladium Palace Ibiza Resort. 10 minutes from Ibiza airport. Double Rooms have twin beds or a king size bed, and a furnished balcony or terrace. Rooms are fully air-conditioned and feature a flat screen TV, Wi-Fi, iPod® docking station, tea and coffee making facilities, laptop safe, bathrobe and slippers plus a pillow menu. Double Rooms have twin beds or a king size bed, and a furnished balcony or terrace with partial side sea view. Rooms are fully air-conditioned and feature a flat screen TV, Wi-Fi, iPod® docking station, tea and coffee making facilities, laptop safe, bathrobe and slippers plus a pillow menu. Superior Rooms have twin beds or a king size bed, and a furnished balcony or terrace. Rooms are fully air-conditioned and feature a flat screen TV, Wi-Fi, iPod® docking station, tea and coffee making facilities, laptop safe, bathrobe and slippers plus a pillow menu as well as a hydro massage bath, a living area with sofa bed and turndown service. Save up to 20% on the hotel price for holidays between 13 - 31 October 2019 booked by 30 April 2019. Save up to 10% on the hotel price for holidays between 16 September - 12 October 2019 booked by 30 April 2019. “ Wonderful Resort in Ibiza! We stayed for 2 nights and loved the resort, rooms, food and drinks. 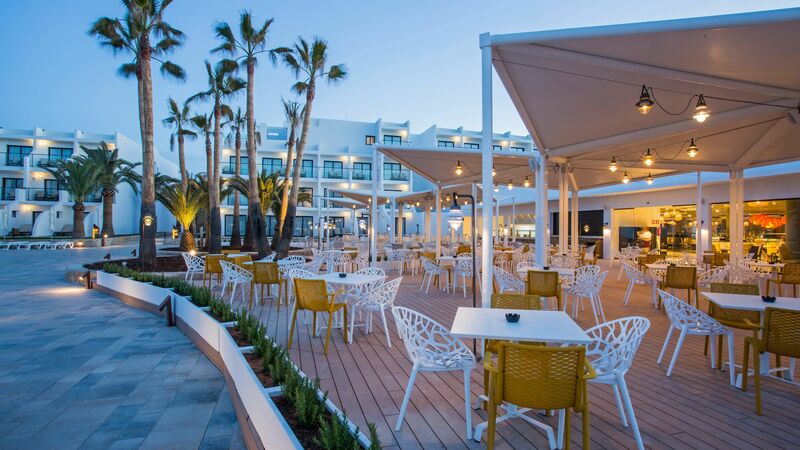 The Grand Palladium Palace Ibiza is right next door and you can use all the restaurants and amenities of both resorts throughout your stay. They have a bridge that connects both resorts. The staff is wonderful and went above and beyond to make our stay terrific. We used the public bus (line 14) to ride into Old Town Ibiza. It?? ?s about 4 miles. The bus is 2 euros per person. The stop is right next to the resort at the Grand Palladium Palace. Myself, my husband & a group of friends stayed here for 5 days recently. Immaculate hotel, helpful staff and rooms/grounds kept lovely and clean. Of 8 of us, there was 4 birthdays (1 per couple) 2 of the couples received VIP wristbands and complimentary champagne on arrival to our rooms. The other 2 didn?? ?t & we had standard bands. We asked several members of staff, all who told us different things, one being that it was due to some having a birthdays. Other than the champagne, there was nothing different about being a ???VIP??? and no member of staff knew what or why this would be different. We arrived early so had a wait for our rooms which was fine, and although we had a baggage storage area we had to get changed in a cramped toilet cubicle. I?? ?ve stayed in plenty of 5 star hotels and all have provided a more comfortable place to change so this was disappointing. Food was ok most of the time, had extremely long waits for food in the sports bar and there didn?? ?t seem to be enough staff serving at meal times. However, 3 of our party got food poisoning on, we think, our last day (still suffering now and we have been home 24hours). Some food was cold / undercooked so I?? ?m unsure as to how well food handling was being managed. Overall, despite the rainy weather, we had a lovey stay. Customer service particularly in the restaurants were a let down, also not being able to book into the other restaurants, being told we had to be down 24 hours in advance at 7.30am to book and despite doing this on several mornings we still could not get booked in. Housekeeping were wonderful, friendly and helpful ladies who happily turned our room into a double on request. Clean, efficient and friendly. But unfortunately the hotel doesn?? ?t warrant 5 star in my opinion. We are still here have been here a week so far the staff are nice and friendly but over worked as it seems is the case most places these days . The weather has been rubbish not the hotels fault this has caused more work for the staff as their is next to no entertainment so everyone is sat about drinking and eating . Our room is nice and cleaned everyday towels changed everyday and the beds changed every 3 days . But the room is small for a family of 4 needs more storage but ideal for a couple with a small child . The room is cold at night due to the bad weather . Food in general is hit and miss everything is too spicy for my girls but thats our tastes we do find something to eat but often end up in he sports bar the extra time club sandwich is very good . Due to lack of staff again you often have to wait for tables to be cleared and queue to go in for food . Childrens area is shoved up a corner of next door in the sister hotel with a very small pool for them and a tiny club house . Drinks are good quality and decent measures . Seating is not good when you can't use outside seating everyone cramped on trendy (uncomfortable un-supportive ) pouffe type sofas . By far the worst thing is people thinking its a real 5* and being self entitled with a woman pushing between myself and another customer saying she needed bacon more than us . Made me laugh but also shows what people here think they are . Haven't tried the a la carte's as getting a reservation isn't easy . End of the day I've stayed in 4*s that are the same and much much better 5*s , Its a decent 4* . Best bit its 7 minutes on the coach from the airport. Worst bit we didnt get a good deal as others have and have paid well over the going rate for this type of holiday . Wouldn't return unless the price changed drastically to a realistic price for this hotel and more activities for children were introduced. Just back from a week here and have to say I was impressed with this resort. Food: The main buffet restaurant had plenty of choice at each meal. Only one day that I wasn?? ?t keen on the food but only as I don?? ?t like seafood. I?? ?ve added some pictures. We ate in two a la carte restaurants. The Italian was good but service was slow when we were there waiting an hour for a pizza. But the Mexican was fantastic and wish I?? ?d booked a second night. The sports bar was good for snacks when the football was on. The cocktails included in the all inclusive were great - best mojitos I?? ?ve had. The resort itself has plenty of pools, backs onto the beach for a morning walk each day and activities for kids, quite a family friendly resort. We had a twin room and it was quite big with a partial sea view which was nice. I?? ?d definitely come back, thanks for a great holiday. “ Lovely hotel, shame on the weather! On arrival we were greeted by a friendly team at the reception. We were not given any information on the Hotel itself but was asked if we had any questions, we'd been up since early hrs so didn't have any questions at that point, however it would have been nice to have been given a map or something of the Hotel. We were unaware that the Grand Palladium Palace next door had pools and bars etc that were part of our all inclusive package and if one of the guests had not told us this we wouldn't have known! We didn't get to try the al a carte restaurants as they were fully booked, so we ate in the Buffet restaurant which was nice but a bit repetitive. 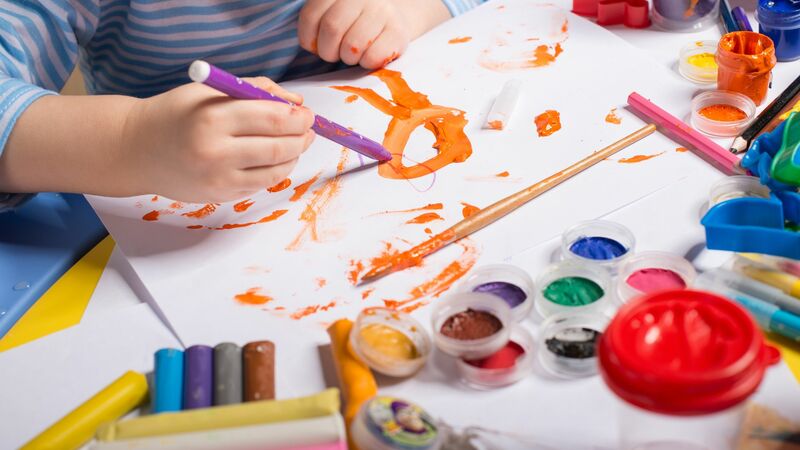 The weather hasn't been great so therefore there hasn't been anything to do at the hotel, I think the entertainment staff should maybe do some things for the guests, especially those with children as quite clearly people were very bored, children running around and using the furniture to build things with. Rooms were very clean and a nice size. Hotel itself clean and smelt lovely everywhere you go. Spa very pricey, have to pay ?? ?25 to use the facilities and massages were ?? ?100 and more, can get cheaper massages back home in England. Overall a lovely hotel and would recommend, would of been better if the weather was nicer but that can't be helped!